Several things have occurred to me over the last couple of weeks when it comes to family meals. Firstly, we seem to be stuck in a rut of eating the same meals over and over as if we are following a rota. We seem to cycle between some of the good old favourites including shepherd’s pie, spaghetti bolognaise, meatballs, tuna pasta and roast dinners. Secondly, now the children are a little older and Faith goes to nursery three days a week, I seem to be feeding different combinations of people on different days. Lastly, I have two shelves stacked high with cook books, most of which haven’t left the shelf in a good few months. So I decided, this is the week to get organised and get down some of those cook books. To make my life a little easier, I jotted down who I am feeding this week and when, then chose three cook books to try out some recipes from. Having visited the Little Dish offices last week for a lovely brunch with the staff I thought the first book I would delve into was the Little Dish Favourites Cookbook. All these recipes are easy to cook and don’t have any added salt. Despite the fact I bought Nigella’s Kitchen a while ago, I haven’t really tried out any of the recipes so this is the week. I have baked quite a few things from Tana Ramsay’s Family Kitchen but haven’t made many savoury dishes yet, so I’m looking forward to giving some of these a go. I also decided that as we are all eating together on Saturday that I would make a special pudding as we don’t really eat them during the week. So here is my day-by-day meal plan for this week – hope I can stick to it! Monday – Corned beef hash from Tana Ramsay’s Family Kitchen. Wednesday – Everybody is eating out so no meal planned. Day off from cooking! Saturday – Crustless Pizza and a chocolate peanut butter cheesecake from Nigella’s Kitchen. Sunday – We are at my Mum’s for Easter. I shall take a pudding (yet to be decided) and a cake for tea. I’ve made my shopping list and feel quite excited about trying out some new recipes. 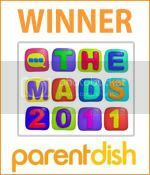 I am still on the lookout for more inspiration so what are some of your favourite family meals? Do you have any favourite cookbooks? This is my exact system. I do this on a Friday night while relaxing with a cup of tea and we do the shopping on the Saturday. It works very well for me. I don’t do a new recipe every night but try to include a couple depending on how hectic the week is going to be. I actually make a lot of my meals from magazines – Tesco’s or Sainsbury’s magazines or BBC Good Food, Olive or Delicious. I think I am going to get myself a subscription to one of them. Your meals this week sound great – hope they taste good. I do the same too and it seems to work. It’s too easy to get stuck in a rut of the same things though. 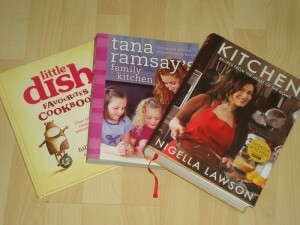 I have those books and Nigella’s Kitchen has to be my favourite I think. Did you see my meal planning post a few months ago on my blog? I meal plan every single week! I also have a Linky on Monday’s where people can link to their weekly meal plans – helps with inspiration! Love the sound of what you’ve got planned this week. If you look further back in my archives, I have a form I made for meal planning and everything. I’m such a geek! I love the Tana Ramsay book, everything I’ve done from there turns out beautifully. Can be a bit of a faff though but worth the extra effort. The mango chicken casserole is on my top 10 list! I’ll be really interested to know what you think about the crustless pizza. I’ve made it and we thought it was tasty but the term ‘pizza’ is really pushing it!